Ahoy - Mac's Web Log - The Sea Devil's Forecastle, first edition 1929, signed in blue fountain pen "Felix Count Luckner Mar '30". 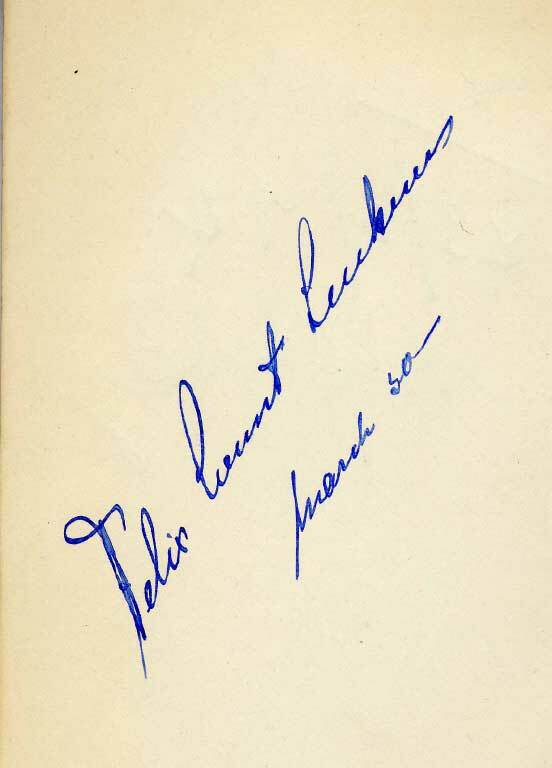 The Sea Devil's Forecastle, first edition 1929, signed in blue fountain pen "Felix Count Luckner Mar '30". On Saturday quite by chance I came across a copy of The Sea Devil's Forecastle, first edition 1929, signed in blue fountain pen "Felix Count Luckner Mar '30". Being a US edition presumably it dates from a US lecture tour. I guess he autographed copies by the thousand. Thank you for your E-Mail, our Count continues to turn up from all over this world of ours, but I believe your experience is my first exposure to Scotland in this regard. Thank you for your kind words about Ahoy, you may be aware that I write and research it all, but the important task of getting it all to face the internet, is done from Atlanta Georgia, by my good friend Terry Kearns. We like to think we team up well. Your note will go on our von Luckner site, and add another small piece about this amazing sailor of WW1. He was indeed a prolific giver of his autograph, and at the least possible excuse would whip out a pen, and often a photograph, which he would inscribe and give to his then companion. This is not to denigrate him in any way, I would be pleased to own one of his efforts, as I admire him and his exploits. Many thanks for your reply and comment. I couldn't believe my eyes when I opened the book. I'm sure you will appreciate my pleasure at finding it and will treasure it. It was in a charity shop priced 2 UK Pounds, about $4 US! I'll get the signature scanned for you when I can. Thanks, look forward to getting it. Would be an interesting exercise to offer the book with the signature information for sale on E Bay, ( but having no intention of selling ) to see what people may be prepared to offer.